Squirrel Talk: Ardija make the news! Omiya Ardija find themselves in a very strange position after only 6 games of the season. We are in the news! Usually the media aren't interested in the Squirrels so early in the season, or if they are, it probably means we are about to fire our coach. But this year is different. The Squirrels are flying high in the league, currently sitting in third place behind Urawa Reds and league leading Yokohama F Marinos. Our coach Verdenik is now finally drawing interest from the press, with everyone eager to find out what he is doing right at Omiya. Prior to this, he was just that old man who always wears a grey baseball cap, never sits down in games and oh...he kept them up but they always do that! 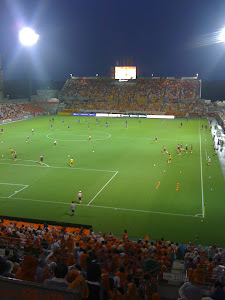 Let's look at where we are this season, and there are two key points for me as an Ardija fan - the points and the performances. Firstly, the points. I'm not getting too carried away with our league position, pleasing as it is. I'm far more delighted that we have 14 points after only 6 games and are well on our way to securing our J1 future next season. A J1 future will allow us to build on the groundwork being done now by the players and the coaching staff. This must be our first goal of the season. It cannot be denied though that we are in with a chance of getting our highest ever J1 finishing position. So far we have never finished higher than twelfth, eleventh place or better should be our second goal of the season. I'm also a firm believer in getting the points on board as soon as possible, so that when legs get tired, injuries occur, and suspensions kick in, the team will be in a better situation to handle any possible points drought that might come along, especially at the tail-end of the season. More positively, I think that Ardija fans are hoping that our current position will breed the confidence to continue the strong performances and avoid the usual down to the wire end to the season. Now to the performances. The basic Verdenik system is clear. He has tried to build confidence in the team by maintaining the same formation and players as much as possible. This might sometimes seem negative, but I think it has allowed Verdenik to get his ideas across steadily and to merge the influence of Zlatan and Novakovic to the players who were at the club under previous manager Jun Suzuki. The formation is clear - 4-4-2. Kitano in goal, in defence Shimohira, Kikuchi, Takahashi and Watabe. The midfield is normally Watanabe, Kanazawa, Aoki and Cho Yong-Cheol. Upfront, when fit Zlatan and Novakovic. I think Kitano is a very sound keeper, I've only seen a poor game from him when it was a very gusty, windy day, conditions which are tricky for any keeper. He has made some very important saves for us over the 17 games and I have a lot of confidence in him. Perhaps his performances are so good, because he knows Ardija have a very capable back-up goalie in Ezumi. In defence the key man is Kikuchi. He often makes timely tackles which have helped to keep us in games and also marshals the troops very well. His partnership last season with Komoto was excellent, but his big job this season is to help youngster and new signing from J2 Tokyo Verdy, Shohei Takahashi fit in to the team and adapt to life in J1. The biggest question mark over Takahashi is his discipline, and this has been shown clearly in incidents in our games against Kashima and Cerezo, culminating in an unnecessary red card in the latter game. Some fans might be worried about Takahashi. However he is young and we need to give him some time to develop and not write him off as a bad boy just yet. His composure on the ball and his role in Novakovic's goal in the 3-1 win over Kashima, suggests he is a talent worth developing. For me the rock of the midfield is Aoki. He does a lot of unselfish work linking between the defence and midfield, and also works hard to break up the opposition's attacks and cover any mistakes that might occur from teammates. He is also capable of finishing, as he did in our opener against Shimizu S Pulse. The midfield players have a very good understanding and the passing between them and linking with the forwards can be very nice at times. This season it has been improved on by the midfield being more assertive in matches, with the team taking the game to the opposition, rather than waiting for an opportunity to break and score on the counter-attack. Cho Yong-Cheol has had a fine start to the season, and though he still needs to keep improving his distribution, he seems to be a much better player this season than the one we saw last season. Does this have anything to do with the departure of Keigo Higashi to FC Tokyo? And finally to the attack. Zlatan and Novakovic are Verdenik's prefered choices. Both have proved to be great purchases for the club and have played their role in the current run. Zlatan has an array of neat touches, holds the ball up well, and can finish well. His match winning goal against Cerezo Osaka last Saturday was a delight to watch as he flicked the ball over the defender's shoulder with his right foot and finished smartly with his left foot. A smashing goal to grace any football pitch in the world. Novakovic is a tall, powerful striker who gives Ardija a strong focus through the middle, but who can play a bit of football too as well as score goals. He did some very neat footwork down the wings during the opening game against S-Pulse. Yu Hasegawa is mostly used as a sub and has the ability to finish when he is on form. Perhaps he needs more of a run in the team to really improve. 22 year old Takamitsu Tomiyama is a great hope for Ardija's future. He has come into the side this season when either Novakovic or Zlatan have been injured this season and has repaid Verdenik's faith in him with some eye capturing performances and a fantastic goal against Kashima Antlers. He has strength, pace and a good shot on him. Verdenik has shown the willingness to blood new players. This year Takahashi, Tomiyama and Imai have been given their chance and hopefully will get more opportunities in the future to shine. He has built a team that is hard to beat, but one that is not afraid to play attractive football and can score some great goals. Squirrels fans must be enjoying this. 17 games undefeated since drawing 1-1 with Urawa Reds on September 1st 2012, one game away from a J League record of 18 games unbeaten, and who is up next for the Squirrels? Yes, you guessed it a home derby match versus Urawa Reds. The scriptwriters are waiting. Which way will it go? But the important thing is to not lose sight of our goals, and to keep performing well. Win, lose or draw on Saturday, we can rise to our highest finishing position in J1 and move the club forward. That is the real victory.